Recently, I was going through the tweets and I came across a song recording of my blogger friend, Purba Chakraborty and I must mention she has a gifted voice..
After listening to it, I just got reminded of the time when I used to have a dream of becoming a singer. I was not into singing Hindi or even Punjabi songs rather was fond of singing the English ones. And I salute to people who can sing them well because they are far more difficult than singing English ones (according to me). Since, I can barely sing a Hindi song maintaining the proper 'surs'. Anyway, I used to think that it doesn't matter in which language you sing since music has no language, it's something that creates a soothing and refreshing aura around you. Right? I started singing when I was around 9-10 years of age. When I was in school, I took part in the Choir and Orchestra, assemblies and many group singing and Carol singing competitions. But I was never confident enough to even try for the audition of solo singing. Years passed and my passion for music grew with time, I was already a singing sensation in my fascinating dreams. Later, during freshman year, I finally took courage to upload a song on Facebook. I got around 60 likes and so, that was a BIG thing for me. Now, I was confident enough that I was ready to sing solo. I tried for the prelims of solo singing in the annual fest. Since, I study in Punjabi University, the judges there, usually preferred Hindi or Punjabi songs (Mostly Punjabi) that wasn't fair at all. I was afraid that I may not get through because of this reason. The first round was just in front of the judges and there was no audience so it wasn't really tough for me. I still remember when I saw the list of short listed students. I read the half of it and I didn't find my name anywhere, I lost all my hope but then I finally saw my name in the last 3-4 names. I felt so contended that I clicked a picture of it and it's still with me. I usually capture these kind of moments. The final prelims were in the Arts Auditorium. I still remember how nervous I was. I had stage fright which I still have and it's a part of my social phobia. My turn was at third number, the 1st contestant (who also turned out to be the winner) sang so beautifully and flawlessly that everyone gave him a standing ovation. Now, I was even more tensed, the 2nd one was okay (she didn't pass through). Now, it was my turn, my heart was pounding at its maximum. I was literally shivering, that also reflected in my voice. I couldn't feel the surrounding, I couldn't hear the soundtrack. I was so anxious and frightened that my mind nearly stopped working and there was a time when there was complete silence. Suddenly, I saw a senior clapping for me so he could cheer me up. He stood up and came in front, he faced the audience to ask them for the same and the very next moment, the entire auditorium was cheering for me. 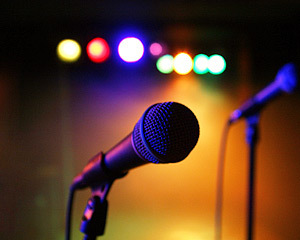 I again gained the nerve for singing and completed my song, I got many compliments after that. Though, I didn't clear the final prelims. That was the 1st and the last attempt of my singing. I don't know whether it's my stage fear or lack of time that I never thought of singing again after that. Sigh! Here’s the Linky, to participate in this Blogfest and also to visit other Amazing Blogs! Omg! I never knew this beautiful poetess friend of mine is such a lovely singer too. You've been gifted with such a sweet, melodious voice dear. I would love to hear many more recordings of yours. God bless.. keep shinning! And undoubtedly I loved the post without forgetting to mention I have two darling singer friends, Purba & Deeshani <3 Hugs! You have a lovely voice Deeshani..and are quite melodious too. Such experiences are to be cherished. Even I click pics of such! You're absolutely right :) It did give me a lot of confidence indeed! Thanks for this most interesting contribution to the Cherished blogfest. Good choice and you have a very good voice. So you are jack of many trades and good at them too! What a great idea! To cherish your voice :) good recording, keep singing. First of all, I want to give you a tight virtual hug for letting us know that you are a singer too! I could so much relate to you after reading this post. Because of shortage of time, even I can't give enough time to music and I keep dreaming that one day I will do something with it. Thank you for supporting the Cherished Blogfest, Deeshani, glad you could make the post so I could hear your lovely voice! Lovely voice! I completely agree, singing in Hindi seems so much tougher than English! Must say you all (You, Purba, Maitreni, Shweta) are blessed with wonderful voices and are a talented lot. Keep singing Deeshani. 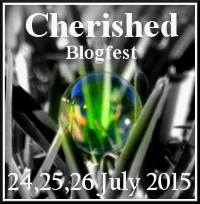 Good you wrote about it via the Cherished blogfest. You sing so well, dear...you should start with it again; at least i would love to hear more. My suggestion would be to never give up, who knows you can be a Professional singer one day (it just takes one sheer luck)! If you are afraid of audience, you can join Toastmasters (i wrote about it few weeks back), where you will learn Public Speaking skills. It has helped me immensely, though i was already an extrovert and anchored in front of a crowd of couple thousand people multiple times in Wipro, Bangalore.